The opening ceremony of the FIFA World Cup was a star studded affair. We saw former world cup winning captain and eternal legend Iker Casillas present the World Cup trophy alongside Russian supermodel Natalia Vodianova. We saw Robbie Williams power through his performance, albeit facing technical issues in the beginning, alongside Russian opera singer Aida Garifullina. Sat upon what looked like a giant phoenix Vienna State Opera soloist Garifullina dazzled the crowd. 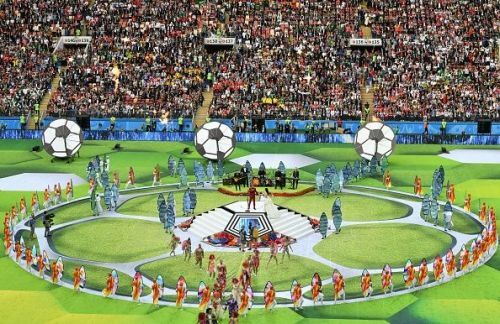 From Russian President Vladimir Putin urging fans in Russia and the ones around the globe to forget their differences and unite in the beautiful game to Robbie Williams' cheekily flipping off the camera the opening ceremony had it all. The 30 minutes of glam, glitz and exuberance came to an end giving way to the main event of the night, the world cup opener match from group A featuring hosts Russia and Saudi Arabia. To say that the opener did not disappoint would be an understatement. To tell you the truth no one really expected the hosts blowing away Saudi in the manner that they did. The opening minutes of the game set the pace for the game with Russia attacking freely and fluently and Saudi backed up against the wall. 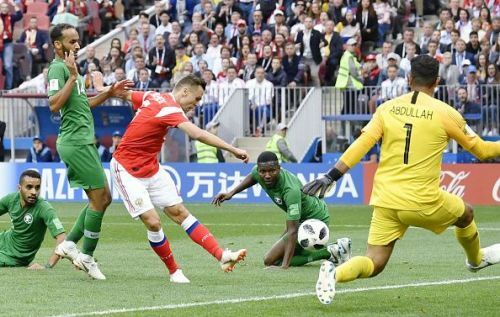 The first goal deservedly came in the 12th minute when the Saudi defense, who had a game to forget, couldn't clear their lines from a corner which led to Yury Gazinsky scoring with the first shot on target in this edition of the World Cup. Perhaps the only thing that didn't go in Russia's favor on the night was the unfortunate injury Alan Dzagoev picked up in the 23rd minute cutting short on his say on the opener. His replacement Denis Cheryshev would have been dissapointed not to be in the starting lineup, but has done all but force his manager's pick for the next game with a man of the match performance. He scored two on the night, his first coming in the 43rd minute to double Russia's lead. In real time he looked to have over deliberated before somehow poking the ball in. But replays showed that he knew what he was doing with a delicious chip over the defender to break free with a cool finish to follow. If things were looking grim for the Asian side at half time it was just about to get worst.Any slim chances of a comeback was put to bed with a gorgeous header goal from Dzyuba in the 71st to stretch the lead to 3 with what was his 3rd touch of the ball after replacing Fyodor Smolov just 60 seconds ago. Saudi looked to hold on and take the loss without further humiliation at the 90 minute mark. The referee added on 3 minutes at the end of normal time. But 3 minutes was all Russia needed to score two more goals to rub salt in already gaping wounds. Cheryshev scored his second, an absolute stunner, in the 91st minute before Golovin curled home a brilliant freekick 2 minutes later. This was a game of firsts in Russia as both Gazinsk & Cheryshev got their first international goal in a very vital match for Russia. With this win the hosts have never lost their opening match in the previous 21 editions of the FIFA World cup. But more importantly for Cherchesov and his men it meant that they have already scored more than twice(5) the amount of goals they got in the entirety of the previous World cup(2). Cherchesov will have an even more difficult job picking the playing XI in their next match against Egypt as two of his substitutes got on the scoresheet. With just one match played Group A is already shaping up nicely and the wuestion on all minds would be who will advance to the next round along with Uruguay. Will it be Russia or will it be Egypt riding on their new messiah. For 32 days work takes the back seat, for 32 days exams and deadlines are the last thing on your mind, for 32 days the world looks onto Russia, for 32 days nothing else matters as the FIFA World Cup 2018 takes centre stage.